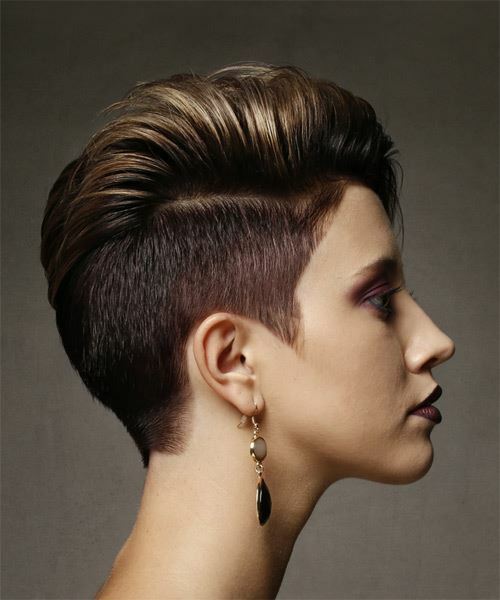 This glossy auburn 'do is tapered into the nape at the back and sides, while the top is left longer on one side to achieve an asymmetric shape. The longer side is flipped over and flicked out showing off the layers that gives the over-all style edge and texture. This funky hairdo is best suited for those with fine to medium hair and needs product for shine and hold. Style the front straight up with gel wax for lift.